So I decided that it would be a great idea to make some jam!!! 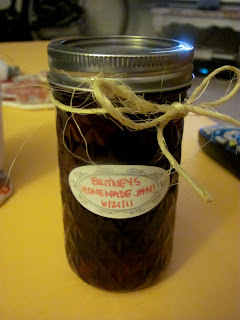 I will try to give clear enough directions so that you too can enjoy some yummy homemade jam for you and your friends! Wash the strawberries in cold water and remove the green parts!!! Cut them in halves or quarters depending on how chunky you want your jam, I did it watching Wimbledon which made it more tolerable! Dump the strawberries into a large pot (a dutch oven would be optimal but I do not have one) and pour all of the sugar on top and combine! It seems like a lot of sugar but trust me it isn't! You can also substitute Splenda or Truvia if you want! Turn the stove on medium and then add the juice of one orange and the zest of a lemon as well as half of a lemon juiced! 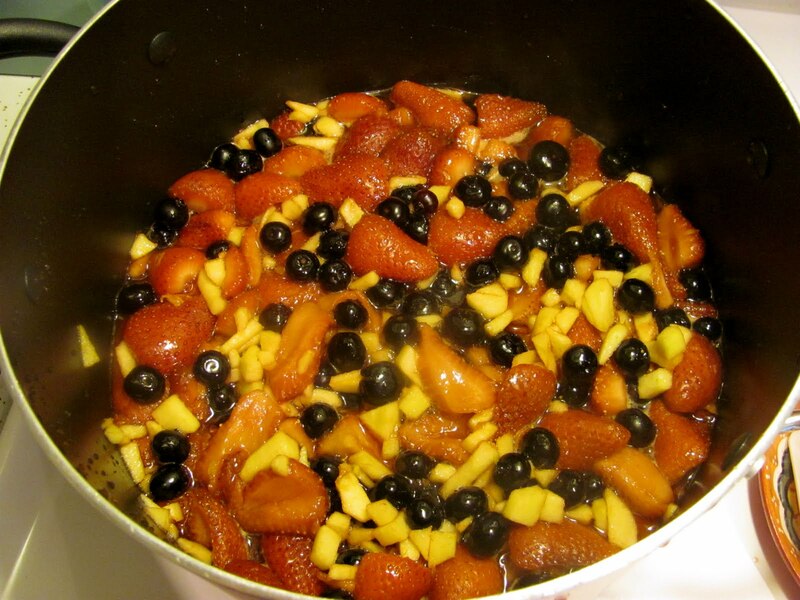 Let the mixture come to a rolling boil, you want it to boil fast so that you can extract the natural pectin from the fruit! Add the blueberries and apple...chop the apple into a relatively fine chop and mix it all together! Let the mixture maintain a boil and let cook for about 20-30 minutes being careful to make sure that it does not boil over because it would be a big big big sticky mess! Scoop off the foam that forms on the top of the jam...it is not a very good consistency in your jam, but taste it because it is really really yummy! I saved mine in a little cup and put it on a biscuit! Now for the fun part...putting it in the jars to preserve it! Now you dont have to do this if you just want to eat it within about 2 weeks! You can put it in a tupperware in the fridge and you are good to go but I wanted to preserve mine to share with friends! So first wash and sterilize the jars in hot water and get them all ready! Fill the jars until there is about 1/2 an inch at the top of the jar so that the air has space to leave! Put the lids on and place the jars in a pot of boiling water for 5-10 minutes! Make sure that the water is covering the tops and be careful when you take them out because they are HOT!!! Finally...let the jam cool to room temperature (probably overnight) and then enjoy! I put little labels on mine and some twine for decoration! Now all of these directions may seem hard but really it is SO SO SO easy and such a great way to utilize and support local farming! I haven't tried the jam yet so hopefully it solidifies correctly and if it is half as yummy as the foam it will be a major success! I wanted to make a jam using the natural pectin in the fruit (hence why I added the apple which has lots of pectin) instead of adding pectin separately because that gets kinda tricky! 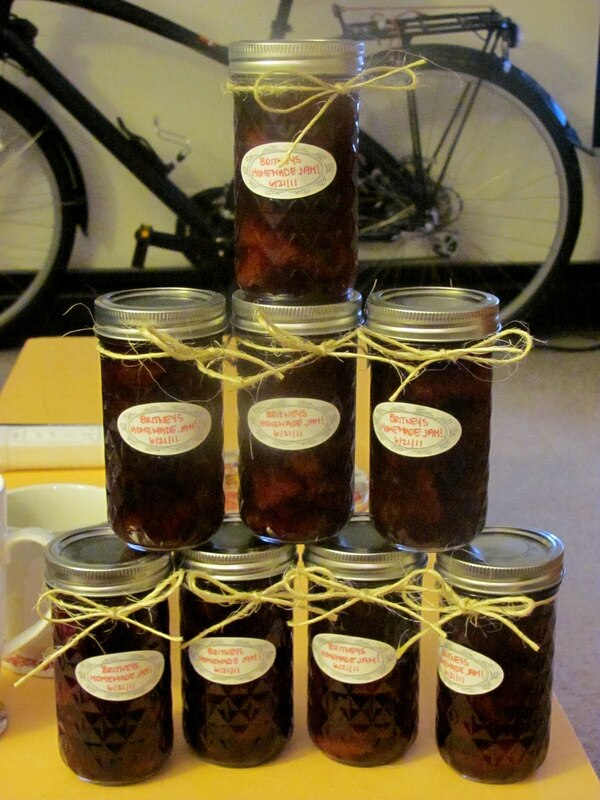 Well I hope this post will encourage the inner chef in all of you...let me know how your jam turns out! Do you need someone for quality control??? I want to tryyy someee! Yay!!!! Can't wait to try some: ) I want to give you a jar of my parents most recent honey take-off, too! Who says Saturdays are for relaxing?